Cathy Joel has never served in the military, but she hopes to send her neighbor, a Pearl Harbor survivor, to the 75th anniversary ceremony of the attack on December 7, 2016. John Seelie is a 93-year-old Veteran who lives in Englewood. Seelie was a 19-year-old soldier stationed at Schofield Barricks on the morning of the attack on Pearl Harbor. He not only fought at Pearl Harbor but also at the Battle of Guadalcanal in World War II. “I’ve served in several battles, but I’m probably one of the last men standing from the Pearl Harbor attack,” Seelie said. Joel is hoping others will assist in her efforts to make the trip possible. She has set up a GoFundMe account and is optimistic that enough funds will be raised for Seelie to return to Hawaii and attend the services. Joel moved to Placida about two years ago. After getting settled in, she knocked on her neighbor’s door to introduce herself, and that’s when she met Seelie. “I brought him a bottle of water and cleaned up a bit around the kitchen, and we talked and became good friends. We go out to dinner every week. He’s a great conversationalist and sharp as a tack,” Joel said. Joel has worked in Boca Grande for almost 28 years. Her career has been in the food service industry. She worked at Miller’s Marina in the 1980s and currently serves food and drinks at the halfway stop at the Gasparilla Inn Golf Course. 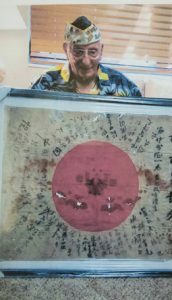 “I would like to honor Mr. Seelie (25th Infantry Division) by making it possible for him to attend these ceremonies in Oahu. He really deserves to be there. He has to be one of the last few survivors left from that battle,” Joel said. Joel said Seelie is in great shape and works out at the Englewood YMCA several times each week. He said he drives himself to the gym and spends 45 minutes working on the machines and then another hour in the pool and spa area. “It keeps me healthy,” he said. Seelie used to own a 20-foot pontoon boat and did a lot of fishing in Boca Grande. He would also ride his bike every few days from his Englewood home to Boca Grande, where he would stop for coffee and socialize with the locals. “I stopped riding when I was 88, when I couldn’t hold a good enough balance at the end of my driveway. I knew it was time to sell the bike,” he said. 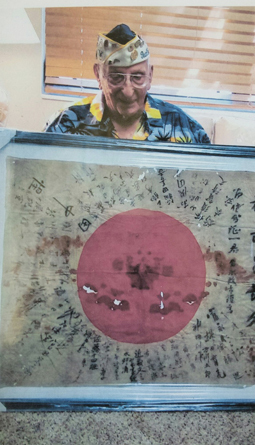 The veteran rediscovered a Japanese silk flag when he was cleaning out boxes in his attic a few years ago. He said the flag still has blood on it from battle. It’s now in a 3-foot by 5-foot frame in his home. “I knew it was somewhere, but between moving a few times I thought it might have gotten lost in the process,” he said. Seelie relocated from Ohio to Englewood 31 years ago. He lost his wife eight years ago, and Joel has become his informal caregiver. At dinner one evening recently, she surprised Seelie with the news about raising funds for the trip. “I think it’s fantastic that Cathy would do something this kind for me. I’m really hoping that she’ll be able to join me on the trip,” he said. Seelie has four children and eight grandchildren who live in Ohio and Indiana. Joel said none of her family members has served in the military, but she feels especially sentimental about Pearl Harbor, because she lived in Kauai for several years. “My beautiful daughter, Malea, was born there,” she said. She discovered Boca Grande in 1989 and has been working here ever since. “Every Veteran is a hero. They help keep us safe every day,” Joel said. Funds raised will be used toward travel, hotel and food for Seelie during the trip. To help with the project, go to gofundme.com/johnseelie or contact Joel at (941) 468-8322.